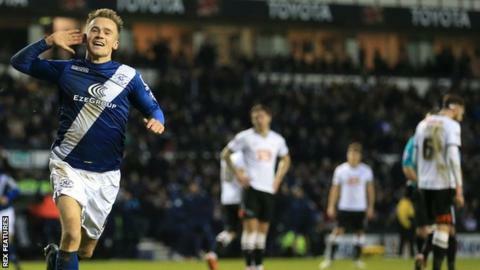 In-form Birmingham City midfielder Maikel Kieftenbeld says that Saturday's 3-0 Championship win at Derby summed up the current surge of confidence coursing through the Blues players. Dutchman Kieftenbeld hit the stunning third goal, his second in three league games, to help Blues move to within two points of the play-off places. "It's a really good result. We believed we could win here," he told BBC WM. "In a stadium like this, I was really happy to be out there on the pitch." Blues' first win in six away games since beating Fulham 5-2 in November leaves Gary Rowett's side eighth in the table, having now taken 10 points from a possible 12 since their last defeat on Boxing Day. But, having gone in all square at half-time, it was not until the 59th minute that veteran defender Paul Robinson's third goal of the season broke the deadlock. And, against a Derby side without a win in the league since Boxing Day, Kieftenbeld says that shattered the Rams' confidence. "In the first half, Derby wanted to make something happen," said Kieftenbeld. "Defensively, we did really well. But, in the second half, our attacking skills were good. We have scored a lot from set pieces. They are difficult to defend. "After 1-0, it was hard for them. Derby did not play with confidence. And, after the second goal, it was almost over for them. It was a great feeling. You can play easily for the last few minutes." Kieftenbeld then added the icing on the cake himself with his second goal in a Blues shirt - just two matches after his first, the late winner against Brentford. "It's a bonus. I did score once in Holland, also from distance. Maybe now I can say now I'm a goal-scoring midfielder, " he joked. "To some extent Maikel Kieftenbeld sums up the Rowett Revolution at Birmingham City. He is undoubtedly one of the Championship's best value buys of the season. Picked up for in the region of £175,000 from Groningen, the Dutchman has given a series of wholehearted performances that have made him a big hit with Blues fans. "Although the sheer volume of games has sometimes caught up with him, his energy and tough-tackling is the ideal foil for Stephen Gleeson's passing game in Rowett's most frequently employed 4-2-3-1 formation. "His recent goals have been a bonus - busting a gut to arrive on the end of James Vaughan's cross for the last-minute winner against Brentford, then unleashing a weekend pile-driver at Derby."